Slips and Falls can happen anywhere in your business and the cost can be substantial to you as a business owner, your guests and your employees. According to the National Floor Safety Institute, Slips and Falls are the leading cause of workers’ compensation claims and are the leading cause of occupational injury. It is estimated that 25,000 Slip and Fall incidents occur daily in the workplace and the resulting compensation and medical costs associated with those slip and fall accidents approximate $70 billion annually. You, as a business owner, can suffer loss of productivity and revenue as well as increased insurance premiums due to a slip or fall in your establishment. Workers that are victim of a slip or fall can suffer from loss of wages and out of pocket expenses. A victim of a slip or fall can also suffer from pain and temporary or permanent disability. Slips and Falls in the workplace are usually caused due to slick, smooth or wet surfaces or trips on a rough or uneven surface. High traffic areas in your establishment, such as the kitchen, accumulate grease, water, and dirt on the floor making accidents a high risk. One of the best ways to prevent slips and falls is an appropriate design of the workplace. A vast majority of commercial kitchens use slippery quarry tile on their floors, which is prone to grease build-up creating a slippery surface. overtime, wear and tear can also cause an uneven surface with damaged or missing tiles and grout. JetRock® seamless flooring is the predominant choice to answer to these potential problems. Slips and Falls can be prevented when you invest in superior materials for your work environment. Our reliable and long-lasting slip resistant flooring is made from a mixture of quartz and specially formulated epoxy resins. JetRock® is installed overnight and directly over your current floor resulting in zero downtime to your facility. 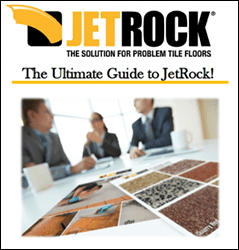 Your new JetRock® flooring system will provide a seamless, long lasting product that is three times stronger than concrete and will not harbor mold or mildew. Contact us for a free estimate and keep your place productive and worry free.